Kraft Heinz Company recalled certain 15-ounce jars of its Taco Bell Salsa Con Queso Mild Cheese Dip over a risk of botulism. 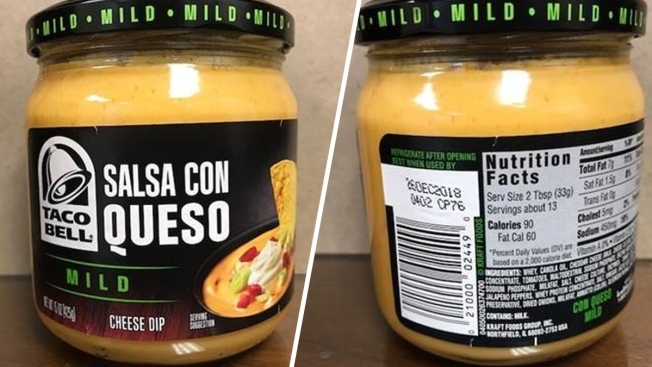 The Kraft Heinz Company is recalling about 59,000 jars of its Taco Bell Salsa Con Queso Mild Cheese Dip that could potentially lead to botulism if eaten. Kraft is voluntarily recalling 15-ounce glass jars with "best when used by" dates of Dec. 27, 2018, and Jan. 23, 2019. The affected items are showing signs of product separation, which can allow for the growth of the bacteria that causes botulism, the company said on its website. Botulism is rare but can be fatal, according to the Centers for Disease Control and Prevention. The illness can cause difficulty breathing and muscle paralysis. Symptoms include blurred or double vision, drooping eyelids, slurred speech, difficulty swallowing, a thick-feeling tongue, dry mouth and muscle weakness. Kraft said there have been no complaints or reports of illness related to the products. The company said it is working with the Food and Drug Administration. The affected items were produced and distributed by Kraft in the U.S. The company urged customers not to eat the dip and return it to the store for an exchange or refund.